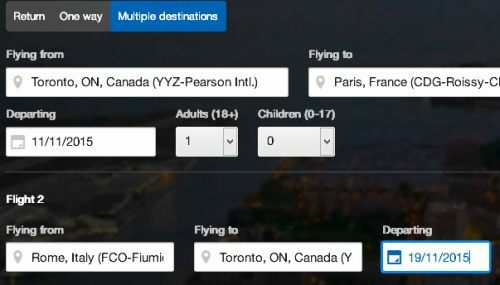 A great price on an open jaw flight from Toronto to Paris, and then Rome to Toronto, for just $565 CAD roundtrip including taxes, and non-stop both ways. The flights involve using a combination of Air France and Alitalia. 4. Now you need to enter a departure date for each leg of the journey. Dec 30 to Jan 10 - $565 -- New Year's Eve! Important: Click on 'Remove segment' before hitting the Search Flights button. FlightHub will give you an error if you don't. NOTE: These can also be booked through Expedia.ca for $11 more. You basically just need to do a very similar type of search, by first clicking on 'Multiple Destinations' when you get to Expedia. How to get from Paris to Rome? Flying from Paris to Rome can cost as little as $29 with RyanAir. For example, if you fly from BVA airport in Paris to CIA airport in Rome. Note that these are both secondary airports. Using easyJet or Vueling, it usually costs somewhere between $50 and $80. ORY airport in Paris to FCO airport in Rome is a common route to find cheaper flights. If you're not interested in Paris, there are now some regular roundtrip flights to Rome for $567 CAD roundtrip flights. 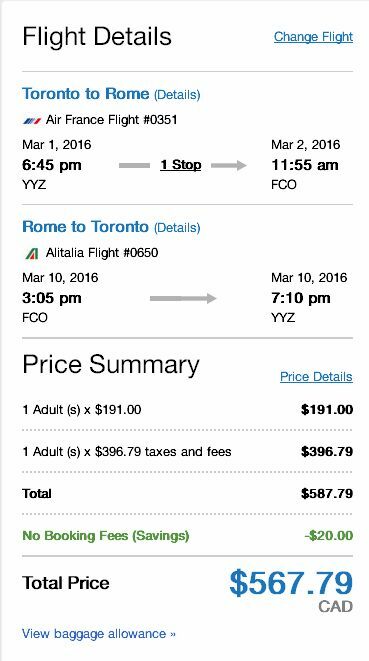 Here's a screenshot from RedTag for a Mar 2 to Mar 10, 2016 flight - from Toronto to Rome, Italy (FCO) for $567 CAD roundtrip including taxes. The flights on the way to Rome are with Air France and have 1 stop. The flights on the way back from Rome are with Alitalia and are non-stop. 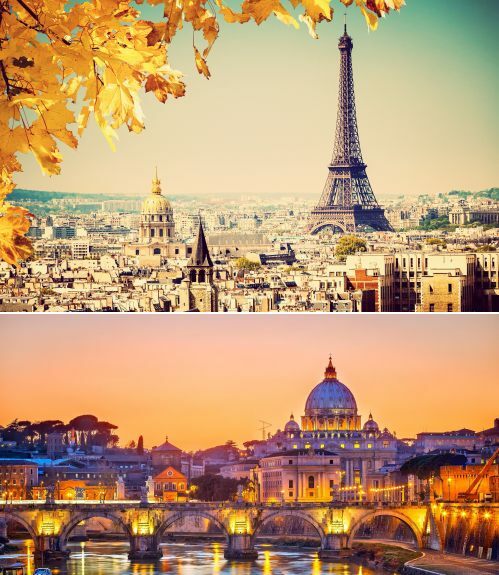 Where to stay in Paris or Rome? The following AirBNB links will lead you to some great deals on places to stay in Paris or Rome for under $100 CAD per night for 2 guests. Special thanks to Rishi 'The One' Modi for being the first to find and post this deal. toronto, yyz, flight deals, europe, western europe, italy, paris, france, cdg, rome, fco, air france and alitalia. 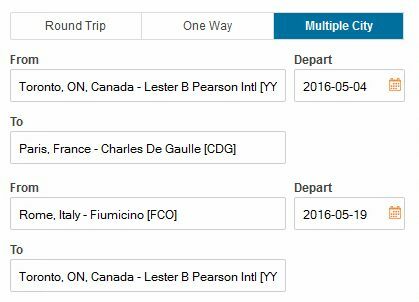 17 Responses to "Toronto to Paris, and then Rome to Toronto - $565 CAD roundtrip including taxes | non-stop both ways"
Only thing is getting to Rome from Paris is still a problem for me. With Ryanair you can fly between the cities for as little as 30$ (rare-- average i've seen is 50-75) but that's if you don't have any luggage with you. If you want to board with 15kg of luggage that's an additional 41 CAD or 20kg of luggage thats 56 CAD. With that said it would still be a $100-150 flight but Ryanair I heard tries to squeeze any fee they can from you. The Dec 30 - Jan 10 option doesn't seem to work for me. Anyone else having any luck? Wouldn't be surprised if those dates sold out first Mike! 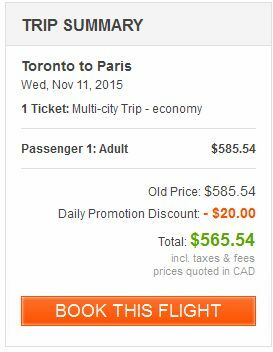 Booked two tickets to Paris for Dec. 7 returning from Rome on Dec. 17 price is $585. Hopefully I get lucky with the flights to Rome! Nov 3 - Nov 12 is down to $498 now!!!! I can't find any deal in above dates. Can someone help?? Do you guys put your money as usd or cad?? Expedia is still listing em at those prices for Dec 30- Jan 10, but keeps price adjusting when you confirm up to about 800. Travelhub is listing them at around 800 bucks. Looks like I was too slow. Booked Nov 5-22 for 2 adults for $1,227.88 CAD. The price said $565 when I was booking but once I got to the final window, the price went up to 1227.88. The prices change every couple of minutes so keep checking back (and deleting your browser history) to get the best price! Some of these are probably being affected by the current price data error coming from SkyTeam (KLM, Delta, etc). They've been popping up from all across North America, and are affecting prices on a number of websites. While these particular Paris & Rome flights were definitely bookable, this recent mass price error is resulting in prices to a large variety of European destinations that are not actually bookable, anywhere. ok......my bad...I was looking at USD. in CAD its $635. Our currency has done down a lot recently!! It can make prices look much more attractive than they really are. Chris, this is a Canadian website. Therefore the prices are in CAD$. What one needs to look very closley at is these prices were published on August 11. Airline prices change.